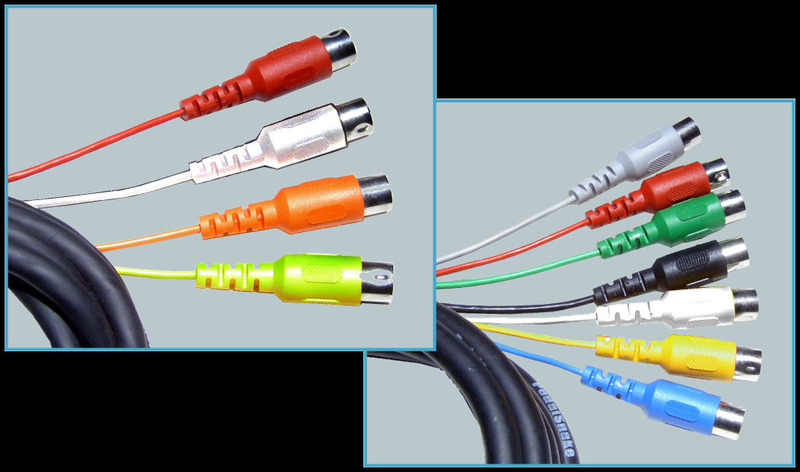 Channels can be used by themselves, or configured with G-Line™ or P-Line™ Pigtails. See BaseSnakes and Pigtails. Custom BaseSnakes are also available, with up to 8 channels. See About Custom PedalSnakes. Terminates in 5pin DIN connectors (like MIDI). Only 3 pins are wired (the original MIDI format). Supports one-way MIDI signal only, no phantom power. This can come in handy with MIDI footcontrollers powered by external power (instead of phantom power thru the cable). MIDI signal is all they require. Shielded for guitar audio signals. Can replace an amp footswitch cable hvaing 5pin DIN plug (3 pins wired). All G-Line Pigtails can be used on a 3wire channel. MF2-I and MM2-I Two Dual Isolated P-Lines PIgtails require a 5wire channel. - It is limited to (roughly) 500mA on a 3wire channel. This is enough to power for a dozen or more 9V stomp boxes. - It becomes a Hi Current P-Line when used on a 5wire channel (see below). Al 5 pins are wired (like a standard MIDI cable). Can replace an amp footswitch cable hvaing 5pin DIN plug (5 pins wired). All G-Line Pigtails can be used on a 5wire channel. All P-Lines work on a 5wire channel. MF1-H becomes a Hi Current P-Line on a 5wire channel. Use with Hi Current Pedals, or chain power to unlimited 9V stompboxes. No Pigtails can be used on a 7wire channel. Available only on Custom PedalSnakes.